[140 Pages Pages] The railway connectors market is expected to grow from USD 802 million in 2018 to USD 1,069 million by 2023, at a Compound Annual Growth Rate (CAGR) of 5.92% during the forecast period. The study involved four major activities to estimate the current market size for railway connectors. Exhaustive secondary research was done to collect information on the market, peer markets, and the parent market. The next step was to validate these findings, assumptions, and market size with industry experts across the value chain through primary research. Both top-down and bottom-up approaches were employed to estimate the complete market size. Thereafter, market breakdown and data triangulation were used to estimate the market size of segments and subsegments. In the secondary research process, various secondary sources such as Hoovers, Bloomberg BusinessWeek, and have been referred to identify and collect information for this study. These secondary sources included annual reports, press releases & investor presentations of companies, white papers, certified publications, articles by recognized authors, regulatory bodies, trade directories, and databases. The railway connectors market comprises several stakeholders such as raw material suppliers, processors, end-product manufacturers, and regulatory organizations in the supply chain. The demand side of this market is characterized by the development of components, platforms, and applications. The supply side is characterized by advancements in technologies and diverse application industries. Various primary sources from both, the supply and demand sides of the market were interviewed to obtain qualitative and quantitative information. Following is the breakdown of primary respondents. After arriving at the overall market size using the market size estimation processes as explained above the market was split into several segments and subsegments. To complete the overall market engineering process and arrive at the exact statistics of each market segment and subsegment, data triangulation and market breakdown procedures were employed, wherever applicable. The data was triangulated by studying various factors and trends from both, the demand and supply sides, in the component, and platform. TE Connectivity (Switzerland), Amphenol Corporation (US), Molex Incorporated (US), ITT (US), Smiths Interconnect (US), Fischer Connectors (Switzerland), Esterline Technologies (US), Schaltbau (Germany), and Sichuan Yonggui Science and Technology (China). Total 15 major players covered. This research report categorizes the railway connectors market based on component, platform, application, connector type, and region. 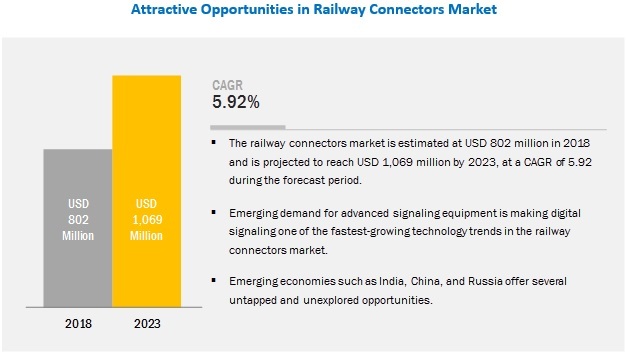 The railway connectors market is expected to grow from USD 802 million in 2018 to USD 1,069 million by 2023, at a Compound Annual Growth Rate (CAGR) of 5.92% during the forecast period. Increased demand for different types of wagons is a major factor driving the growth of the railway connectors market. Wagons are rail vehicles used to carry passengers and freights. These vehicles are not equipped with propulsion systems and hence, are drawn by locomotives. The demand for wagons is continuously growing in countries such as the US, the UK, France, etc., due to increased industrial activities. By platform, the rolling stock segment is expected to be the largest contributor in the railway connectors market during the forecast period. Rolling stock refers to powered and unpowered vehicles that move on rails. It also includes wheeled vehicles used by businesses on roadways (such as trams) and other Light Rail Vehicles (LRVs). Moving passengers and freight by rail is far more cost-effective and efficient as compared with other means of transportation. Advancements in technologies such as turbochargers, power electronics, and semiconductors, coupled with significant reduction in vehicle weight, help improve the speed and comfort of transit systems. Connector body component segment is expected to account for the largest market size during the forecast period. Connector body is most commonly used type of connector, from traditional industry-standard connectors to innovative new designs, because it has been the standard for a long time. The connector body is used widely in modular machine design, factory automation, robotics, transportation, and power generation. It offers various benefits, such as easy customization with standard modules and space saving. Also called as Radio Frequency (RF) connector, it is an electrical connector designed to work at the radio frequencies in the multi-megahertz range. The connector body is typically used with coaxial cables and is designed to maintain the shielding that the coaxial design offers. Europe is expected to account for the largest market size during the forecast period. Europe is the primary revenue generating region in the railway connectors market. Most European vehicles are equipped with high-end technology that includes wireless radio connection, wireless data transmission, eco-friendly cars, and comfort features. However, adoption of high-end technology is lower in the East European countries as compared with the West European countries such as the UK, Germany, France, and Spain. This provides rolling stock OEMs an opportunity to increase their presence in Eastern Europe. France plans to increase the number of rail lines and tramway locomotives. Major vendors in the railway connectors market are TE Connectivity (Switzerland), Amphenol Corporation (US), Molex Incorporated (US), ITT (US), Smiths Interconnect (US), Fischer Connectors (Switzerland), Esterline Technologies (US), Schaltbau (Germany), and Sichuan Yonggui Science and Technology (China). TE Connectivity has launched a wide range of advanced products in the past few years to compete strongly in the railway connectors market. For example, in January 2017, it launched an advanced version of ACT composite connectors in the DEUTSCH MIL-DTL-38999 series. In December 2016, Amphenol Corporation introduced a press-fit stacking connector, which is 56-position VPX footprint-compatible connector specifically developed for rugged, high-speed applications. The core competence of the company lies in the connector and sensor technology, and the company plans to continue working strongly on it. The company is strategically developing innovative products for upcoming trends in the end-use market. In September 2018, TE Connectivity launched new 124 position Sliver internal I/O connectors and cable assemblies, which provide a high density solution that enables up to x20 signal transmission lanes, or 40 differential pairs. In February 2018, Amphenol Corporation expanded its RJ Field & USB Field range of rugged connectors with two new reduced flange versions of RJF TV6 and USB3F TV for reduced spaces railway applications. The RJ and USB reduced flange receptacles combine space and weight savings with performances equal to standard RJF TV6 and USB3F TV receptacles. In January 2017, ITT completed the acquisition of Axtone Railway Components (Axtone). This acquisition is highly complementary to its legacy KONI brand as Axtone produces energy absorption solutions, such as springs, buffers, and coupler components that are critical safety technologies. What will be the revenue pockets for the railway connectors market in the next five years? Who are the leading manufacturers of railway connectors in the global market? What are the growth prospects of the railway connectors market? What are the major drivers impacting the railway connectors market?